The bestselling touchscreen phone, known by a number of brand names in different regions, is to be used in trials in Spain, France and Dubai — but there are no plans yet to make the NFC version of the handset available at retail. The model chosen by Samsung for its first new NFC phone is the bestselling S5230, known in different markets under a variety of brand names including Tocco Lite, Star, Player One and Avila. 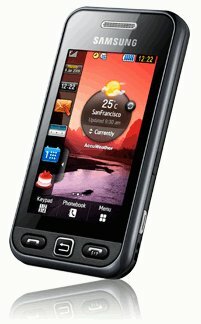 Introduced in May 2009, the mid-range touchscreen phone sold over 10 million units within six months of launch and has topped the best seller lists in the United Kingdom, Italy and the Netherlands. The phone has been chosen for a number of forthcoming near field communication trials including Telefonica’s pilot in Sitges, Spain and Etisalat’s test in Dubai. It is also being used this week in an NFC trial taking place at the Mobile World Congress and is also expected to be used in the French Nice NFC City trial due to begin during the second quarter of 2010. The special NFC version of the S5230 is only available on a limited basis for use in trials, Samsung has told NFC World, and no commercial launch date has been set.